The image of a grimy geared locomotive dragging a string of skeleton log flats out of the woods can draw just about anyone to translate this vision to their model railroad. The proliferation of standard and narrow gauge logging railroads in the latter part of the 19th century and well into the 20th century provides us many prototypes to emulate. Railroads were built virtually overnight to transport first-generation virgin timber to waiting mills to feed the building boom of a growing United States. This virgin timber found its way to lumber mills to be cut and planed into everything from toothpicks to railroad ties, mining timbers to homes for sheltering the growing number of immigrants. In that image of the grimy locomotive we see 40-foot logs, as big across as a small boy, balancing on a wooden skeleton, moving over rails laid directly on the forest floor. At the end of its journey these giant trees give their lives at the hands of a rip saw and planer, hopefully under an open-framed shelter on the edge of the woods near a nice trout stream, a romantic scene worthy of being recreated in our scale world. Taking what the lumber barons left behind, the pulp and paper industry was more likely to use the smaller, softer trees like hemlock, balsam, poplar and fir. Size was not an object as this timber was to be reduced to a pulp for use in newsprint or paper. 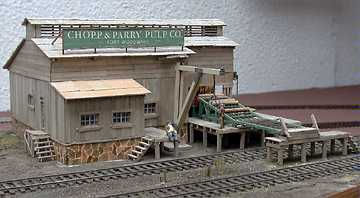 The addition of a pulp mill to a model railroad will generate new and interesting traffic. 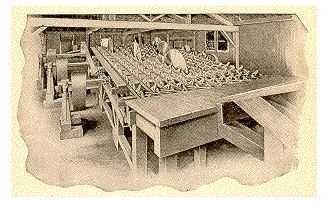 The first pulp mill on the North American Continent was built in Germantown, Pa., in 1690 by William Rittenhouse following techniques developed in Europe. He constructed his mill near the city center where an ample supply of rags was always available for reduction to pulp and then pressed into paper. 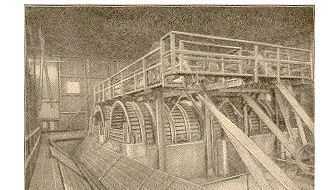 By 1810 some 185 mills were operating in the new United States. With so many mills in production, the supply of rags became scarce, the search was on for new raw materials. Many were tried and still used today, including tree bark, bagasse (sugarcane waste), straw, and cornstalks. It wasnt until the introduction of mechanical wood grinders and new technology developed in England that ground wood pulp was used in paper production. The first US newspaper to be printed on paper made from ground wood pulp was the Boston Weekly Journal on January 14, 1863. Ground wood is strictly a grinding process to reduce wood to pulp using grinding stones or mechanical grinders along with plenty of water. Due to the nature of this process the ground wood contains wood fibers that are fragmented and there is significant debris. As ground wood contains all of the elements of the tree, papers produced in this way are subject to discoloration, are weak in strength, and are mainly used in the production of newsprint and low cost book paper. The use of chemicals to reduce wood to pulp was developed in the United States as early as 1857 and chemical wood pulp icame nto full production by the 1870s. A Sulfite cooking liquor was first developed, then by the 1940s a less corrosive process called the Kraft process was used to loosen the fiber and completely remove the cellulose. The pulp is placed in a large cooking vessel with the cooking liquor at an elevated pressure. The mixture is blown out of the vessel, strained, separated, and pressed into bolts for final use in the paper mill, normally located close by. Papers produced from this process are of high quality and high strength. In researching this project I wanted to do something different. With my Copper Country projects I am always modeling from photos or plans of prototype structures. 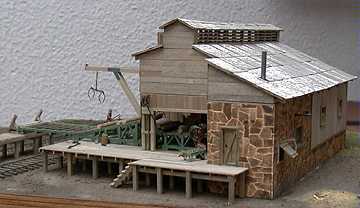 This model would reside on a good friends railroad and I had free reign to do almost anything I wanted. His only requirement was that he wanted a pulp mill set in the Northwest in the early 1930s. Instead of researching the area he was modeling to look for subjects, I decided to model the process and then I would design a structure to go over it. My design would have been built in the early 20s and would have had a decade of operation under its belt by the time portrayed on the railroad. A few trips to local used bookstores turned up Modern Pulp and Paper Making written by G.S. Witham in 1920. Perfect. I didnt have much room to work with, like any of us do, so I had to limit the design to a small family owned operation. This operation would take about three flatcars of pulp wood per day and would produce one or two box cars of pulp lap to be shipped off to a nearby paper mill. Tank cars would also be in demand to support the cooking process. 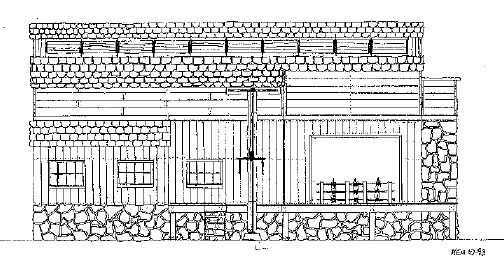 I divided the plant into two different structures, the sawmill / wood room, where incoming wood is reduced to chips, and the digester plant, where the cook takes place. The sawmill and wood room is the subject of this article. Chopp & Parry Pulp Co.
Based on what I learned in Mr. Withams book I designed this operation to derive power from a small steam engine consuming wood waste, mainly generated in the sawmill. A belt system is used to transfer power to the individual pieces of equipment used in the chipping process. The sawmill would accept eight-foot logs directly unloaded from pulpwood or flat cars. These logs would then be transferred to three inline slasher saws (as seen in Figure 1) which reduce the trunk to four two-foot long pieces. A separate conveyor transfers the logs to the cleaning / soaking tank. The logs are soaked to help loosen the bark. After a period of time the logs are moving into the Barker drums which roll and scrap the logs to remove the unwanted bark(as seen in Figure 2). The bark and waste water is removed through a drain in the rear of the plant where the bark is discarded or sold, depending on the local market. Bare logs float in a trough to two manually fed chippers (as seen in Figure 3). A chipper is basically a very large food processor that is helped along by the fact that the log is now saturated with water, which helps to cool the chipper and softens the wood. The output from the chipper is transferred under the mill floor by conveyor to the Shaker Chip Screen (as seen in Figure 4). The Shaker screens out material to a particular size needed for the cook. Material that is too large is either sent through a re-chipper or is discarded, in the case of knots and other deformities. The final product is made up of very uniform pieces of raw wood. The uniformity allows for a very controlled cook and produces superior pulp. The material from this mill would run by conveyor under the mill to the attached digester plant. Thats the subject of another project for another time. 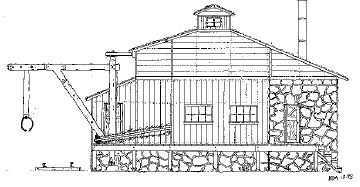 The entire structure and all interior details were constructed from strip basswood, thread, single ply tissue and plaster, with the exception of the power transfer wheels, which are Grandt Line products and the metal roof material which is from Campbell. 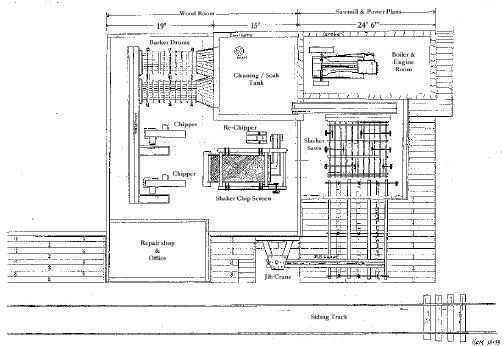 The stationary steam engine and boiler are housed in a separate stone building, isolated from the rest of the plant to keep stray sparks from entering the sawmill or wood room, but still in close proximity to eliminate the need for extensive power transfer. The only opening is where the drive shaft exits the power plant, and in reality would have contained a bearing of some form. The power plant operator shovels wood scraps through the back door trap, to feed the boiler. Labor was cheap in the 30s. 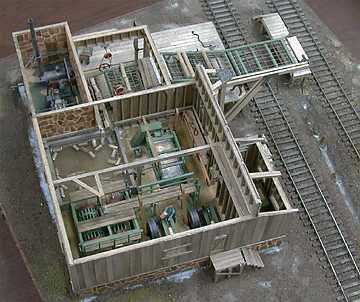 The boiler and steam engine were constructed using wood scraps and metal tubing of various diameters. I used the plans from Model Masterpieces, Cripple Creek Boiler and Miniature Machine Works, Steam Mill Engine, to reproduce them. The power transfer belts were made from single ply tissue painted brown, cut with a very, very sharp Exacto, looped and glued in place. The stonework for the entire mill and the soaking tank were constructed of plaster using a technique I described in my fall 1994 article in the Hotbox. If you will take notice, the structure at the top of that article is this mill when only the stone and concrete work was completed. Logs, eight feet in length arrive at the mill and are directly unloaded using a Jig crane onto a conveyor, which feeds the Slasher saw. The Jig crane is based on a Durango Press model and could be substituted directly. 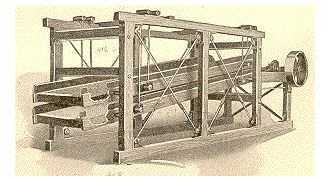 The arbor conveyor that holds the wood during sawing was constructed using brass tubing to simulate the drive system and thread to simulate the conveyor. The base is made from basswood framing. The Slasher saw was constructed in the same manner. The saws were made from foil. The platform was built board by board and aged in an alcohol and India ink solution, as was every board on this structure. The boards were stained in groups of lighter and darker shades and mixed up before application to highlight the difference of each individual board. The cleaning / soaking tank was made by building up four plaster walls to construct the sides of the tank. Plaster was then poured into the center to form the bottom of the tank. A drain was installed before the plaster dried. Using a standard modeling polymer with a bunch of logs floating on the top finished it off. The Barker Drums were constructed using wet basswood strips formed around a dowel to produce the steel drum rings. The steel slats were built from basswood and attached to the rings. A wooden frame was built up around drums and platforms were added to the top of the frame like the prototype. The Chippers were built from dowels with a small dowel to simulate the chute to load the logs, an operator is performing this operation on the model. The shaker chip screen is framed in wood like the prototype and I attached some leftover screen material. The Wood Room exterior walls were built as a framed wall and constructed board-by-board. The windows were framed by hand as well and filled with Microscale, Micro Kristal Klear to simulate the poor quality windows of a backwoods 1930s mill. I constructed the roof framing board-by-board as well, which can be removed to expose the detail within. I did not enjoy adding all those ventilation slats on the cupola, but it makes the workers cooler in the summer and adds a nice accent to an otherwise boring roof line. The roof is made from Campbell corrugated aluminum roof material stock. Using Printed Circuit Board Etchant, which can be found at Radio Shack, the roof material was rusted, a process described in countless modeling articles. Designing a structure based on the process turned out to be an interesting project and one in which I learned quite a bit about the process I was modeling. The plans for this structure are included in this article, but I would recommend that you go out and research something you are interesting in and develop your own plan.. This model will soon find its place in Fort Woodward, a small town in the mountains of Washington State on the Great Northern mainline. This industry will provide a new source of revenue to keep this railroad active for years to come. Try modeling a process for your next project.